My grandmother’s boxful of books is all I have so what now? The old woman bustles from bookshelf to bookshelf in her musty but comfortable basement. Her fingers dance over each tome. I know right away that to her, Dostoyevsky and Tolstoy are not just names, but family. She plucks a well-worn hardcover from the shelf and places it on a table. 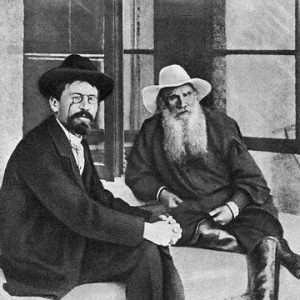 Anton Chekhov and Leo Tolstoy at Yalta, 1900. Russian fairy tales. “You’ll like this one.” Another book, thinner, newer: an analysis of gender roles in Chekhov. As the books pile up in a rickety tower, I come to understand that each one is a piece of her history, a piece of her that she feels safe enough to share with me. The old woman is my grandmother. We are meeting for the first time. I’m 20 years old. Growing up as the daughter of lesbian mothers, I always knew I had a sperm donor, and that I could meet him when I was 18 if I wanted to. Meeting Jonathan was surreal: We unspooled for one another the narrative threads of our lives, and each new piece of information felt like part of my history sliding into place. We had uncanny similarities, but the most striking one was our hands. We had the same knuckles, the same gibbous fingernails. The reality of our connection felt inescapable. It took him two hours to get it out. His mother, Toby, had come to America after the Holocaust. Something had happened back in Poland, something Jonathan himself didn’t know or wouldn’t talk about, but that clearly mattered to him, and to her. My donor had an adopted son, but I was Toby’s only biological grandchild, and she was getting on in years, and would I be willing to meet her? And so, some months later, my donor and I pull up in front of Toby’s one-story bungalow on a quiet suburban street in Albany, New York. After a round of awkward introductions, we settle in for dinner. Is it just me, or is the unseemly mechanics of sperm donation hanging over every interaction? I scrutinize my new grandmother for signs of foreignness. She has a slight accent, but if she ever carried the trauma of the past in her body, those scars had faded over time. She is just an old woman. It is just a family dinner. My donor leaves after we eat. Toby’s demeanor changes. Without her son here, she is free to be someone other than Jonathan’s mother. She can be an immigrant who has discovered her bloodline extended further than she thought. She takes me on a tour of her home, pointing out not the photos of Jonathan and his brother but the art on her walls that came from her home country. We don’t talk about her life. We talk about Eastern European literature and Russian art. I leave that day with a cardboard box full of books and a gold-plated bracelet that matches the one on her wrist. I came away with the understanding that I wasn’t there to share my story or to get to know her as my grandmother; I was there as a descendant. In the years since I met Toby, I’ve wrestled with my obligation as the last generation in her bloodline. Do I owe it to her heritage to have children or to kindle some Jewish faith of my own? It seems that the clearest directive from that fateful meeting is to read those books. They still sit on my bookshelf. I haven’t cracked even one.